All the Bright Places (Prebound) | Let's Play Books! The beloved "New York Times "bestseller that "Entertainment Weekly "described as sparkling and says get s] under your skin. You won t soon forget this heart-wrenching, unflinching story of love shared, life lived, and two teens who find each other while standing on the edge. Theodore Finch is fascinated by death. Every day he thinks of ways he might kill himself, but every day he also searches for and manages to find "something" to keep him here, and alive, and awake. Violet Markey lives for the future, counting the days until graduation, when she can escape her small Indiana town and her aching grief in the wake of her sister's recent death. When Finch and Violet meet on the ledge of the bell tower at school six stories above the ground it's unclear who saves whom. Soon it's only with Violet that Finch can be himself. And it's only with Finch that Violet can forget to count away the days and start living them. 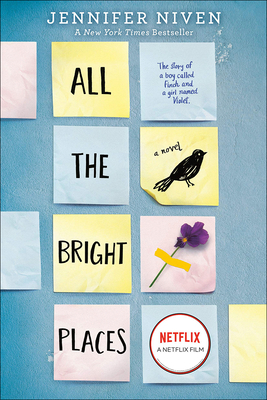 But as Violet's world grows, Finch's begins to shrink. . . .
At the heart a big one of "All the Bright Places" lies a charming love story about this unlikely and endearing pair of broken teenagers. " The New York Times Book Review"
A heart-rending, stylish love story. "The Wall Street Journal"
Impressively layered, lived-in, and real. Buzzfeed.com. Jennifer Niven is the author of the "New York Times" and international bestseller "All the Bright Places, "as well as her new YA novel, "Holding Up the Universe." She has also written four novels for adults "American Blonde, Becoming Clementine, Velva Jean Learns to Fly, " and "Velva Jean Learns to Drive" as well as three nonfiction books: "The Ice Master, Ada Blackjack, " and "The Aqua Net Diaries, " a memoir about her high school experiences. She grew up in Indiana and now lives with her fiance and literary cats in Los Angeles. For more information, visit JenniferNiven.com, GermMagazine.com, or find her on Facebook or Twitter."